The modularity of CodeMeter Embedded 2.0 allows manufacturers to be in control of the secure licensing features they want to implement into their embedded software. The next generation of CodeMeter Embedded will be introduced by Wibu-Systems at Embedded World, Nuremberg, hall 4, booth 540, 14-16 March. CodeMeter Embedded 2.0 is a runtime environment that supports the complete array of platforms and operating systems intelligent device manufacturers (IDMs) rely upon, including Intel x86, PPC, ARM, Windows, Linux, Android, VxWorks, and QNX. The modular and scalable design enables developers to integrate only the functionality they need and create a software solution with the smallest footprint possible, the highest level of security and the most versatile licensing, all without affecting performance. CodeMeter Embedded 2.0 licenses are fully compatible with their desktop counterpart, so that even complex architectures that include industrial computers, mobile devices, embedded systems, and microcontrollers can benefit from the same core features: software protection, license lifecycle management, and security mechanisms. Higher performance: A sophisticated use of license information caching in CodeMeter Embedded 2.0, previously available only in the desktop version of the technology, provides rapid access to licenses even in the event of concurrent and simultaneous access from different applications. Multi-Interface support: Extremely small, energy-saving, battery-operated devices also require a special design for the hardware secure elements; besides the more common interfaces for USB dongles, SD, microSD, CF, and CFast cards, CodeMeter Embedded 2.0 supports SPI communications as well as custom made ASICs (CmASICs). OPC UA support: CodeMeter Embedded 2.0 is fully integrated in Unified Automation ANSI-C based OPC UA SDK where it brings an additional security layer to the native protections of the OPC UA standard; cryptographic keys, trust lists, and sensitive license-based configuration files are stored in the smart card controller embedded in all CodeMeter hardware secure elements. TPM support: CodeMeter Embedded 2.0 can also interact with software-based licenses, which can be bound to a Trusted Platform Module in the target system for a higher level of security. 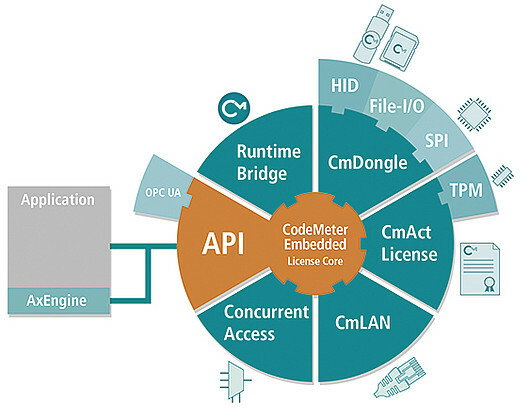 CodeMeter Embedded is unique in the market and builds a bridge between traditional computing and embedded systems by enabling the core secure licensing and integrity protection features on demand. Wibu-Systems‘ professional services team is available to assist original equipment manufacturers in their journey towards a profitable Industrial Internet age. Oliver Winzenried, CEO and founder of Wibu-Systems, explains: "At each industrial trade show where we have showcased our technology, I was confronted with IDMs in need of a reasonable compromise between a modern business model and the restrictions of their development platform. CodeMeter Embedded 2.0 was designed to meet the needs of Industrial Internet manufacturers, provide extreme adaptability to the hardware requirements of the main infrastructure, and offer an advanced entitlement platform that opens the door to a multitude of after-sales models."